because it was originally published in Latin, was both the ending and the beginning of a line of reasoning and it has come to be seen as an end in itself. This celebrated phase, perhaps the most famous philosophical utterance ever, has seeped into our collective consciousness. As part of his voyage of understanding and reasoning about the nature of reality, Décartes doubted the evidence of the senses to tell him what has real . He instead came to the conclusion that he could only assert the existence of his own reality on the basis of the fact that he was thinking . He was, after all, thinking about the doubts he had about the nature of reality. Décartes published the Discourse on Method in 1637. It was well received at the time and has continued to be profoundly influential over the centuries. I don’t want to refute Décartes’ philosophy or the process of careful reasoning that led to his conclusions but I would like to make a plea for an alternative maxim. We aren’t just a mind. We have a body and it too is who we are, but maybe we are too busy thinking and am-ing to remember that. Our corporeal selves are so rarely central to our lives, unless they go wrong. We consider our bodies mostly in terms of the outer surface, often seeing that superficial aspect of our body negatively: berating ourselves for being too fat, suddenly deciding that we should run a 10k road race, worrying about body hair, wrinkles or not being sufficiently ripped. Our bodies are three dimensional structures but we generally forget that our bodies have a back and sides as well as a front. As for what goes on in the middle? Well, how often do we spare a thought for our breathing, our heart, our digestion? 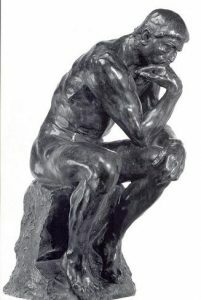 Rodin’s Thinker cast in 1902. Certainly pensive but definitely lacking joie de vivre, wouldn’t you say? We need a re-think. Ironic huh? Why don’t we set thinking aside and dwell in an alternative reality? What can you feel right now? your feet in your shoes and your shoes on the floor? What about beneath the skin…the shoulder blades…hunger…fullness…pain…warmth? When you have a spare five minutes waiting for the bus or Doctor’s appointment or during your lunch break, go with “I feel therefore I am” and use your noticing mind rather than the thinking mind. This might be particularly helpful if you’re zone of “I think therefore I’m going crazy” , “I think therefore I’m anxious” or “I’m on social media therefore I am”. We need to get back our sense of body in order to have a really good mind body connection. That phrase is chucked about without much consideration but it’s an incredible meaningful thing: the harmonious balance and interconnectedness of the thinking mind and the corporeal self. Why does that matter? Well, you will do Pilates much more effectively. You can reverse that as well. Doing the Pilates will help to engender a better mind/body connection, (and of course likewise, Yoga, T’ai Chi to name but two other exercise disciplines). I see people every day whose movement suggests that they have little or no awareness of their body. Why is this? In our culture it is not considered important. None of these people are doing anything out of the ordinary. It’s not merely a low priority – it doesn’t seem to signify at all. So we allow ourselves to have terrible posture, to become stiff and immobile, to be unable to maintain positions like kneeling on all fours or sitting on the floor. I’m not even talking about way-out stuff here. It is commonplace for people to be unable to move the shoulders and arms correctly or be able to walk with good pelvic stability. Well, there’s also the Mindfulness argument – the act of thinking less and being aware and alive to the present moment. There is a Wellbeing argument – our body is always communicating with our thinking mind, but we have to listen to our physical feelings and then interpret in order to make sense of our health, illness or simply to gauge our bodies satisfaction with its lot in life. If we were more “in” our bodies, then we would have a greater awareness that we too are animals. Animals who share the planet with lots of other animals . And that raises some uncomfortable questions about how we treat other species and the environment. Arghhhh… I’m thinking too much. So I’ll exit, leaving you with Nina Simone. Her take is a little different but still relevant (and entertaining) in that it celebrates the body over and above the mind, over money, over possessions. Her song asserts that our bodies are who we are and urges us to recognise and celebrate that. I would like to thank Mr Ian Moxon, Retired Lecturer in History at the University of Leeds, for writing the splendid title to this blog post. ha ha Astrid! Yes we can’t stop ourselves can we – thinking that is!